This weekend we celebrate Nancy Astor’s birthday, said to be on the 19th May. But is there more to this birth date than meets the eye? Head of Archive Services Guy Baxter takes a closer look at the mystery surrounding Nancy Astor’s birth. The first female MP to take her seat in the British House of Commons, Nancy Astor was born (as Nancy Langhorne) in Danville, Virginia. But when exactly? It is not unknown for celebrities to be coy about their age, but there was no such vanity from Nancy Astor. The mystery in this case surrounds not the year (1879) but the date of her birth. Stranger still, it was not until the publication of Adrian Fort’s extensively researched biography in 2012 that the mystery came to the attention of the public – or even specialists in the field. Fort sums up the mystery thus: “It was at street level in the newly built house at Danville, in a room with dull green walls and a bare wooden floor, that Nancy was born on 30 January 1979 – although subsequently, and throughout her adult life, her birthday was, for no clearly stated reason, given as 19 May.” The biography is aimed at the general reader so, understandably, there is no footnote; I therefore approached the author and asked his source. What came back to me was a scan of Nancy Astor’s birth certificate extracted (with some difficulty, I gather) from the State authorities in Virginia. The plot then thickens somewhat. Waldorf Astor (Nancy’s second husband) was born on 19 May 1879. So Nancy Astor, for much or her adult life and to the extent it confounded biographers and academics for years, seems to have adopted the birth date of her second husband. stery in mind while researching in the archives; and finally we might use this as a starting point to explore some wider implications and issues. The speculation first. Is the Virginia record incorrect? There would seem to be no good reason to back-date a birth record, and it seems like an odd error to make. Having said that, the strange case of Ulysses Simpson Grant springs immediately to mind. Born and raised as Hiram Ulysses Grant, he was the victim of an assumption made by the Congressman, Thomas Hamer, who nominated him to enrol as a student at West Point. A family friend, Hamer only knew him as Ulysses and inserted Grant’s mother’s maiden name (Simpson) into the register. The United States Army bureaucracy proved immovable and Grant, once he realised the error, was unable to change it. By the time he became the head of the U.S. military and 18th President of the United States, it may well have ceased to bother him, and it gave him the patriotic initials “U.S.” which proved a boon as his military career took off. So mistakes in an official record can be hard to change. If the record is correct, then we must ask whether Nancy was aware that this was her birth date. Could her family have deceived her? Apart from the fact that no obvious reason springs to mind, neither this idea, nor that of an administrative mistake, explains the co-incidence with Waldorf’s birth date. Though it should be noted that the odds of two randomly selected people sharing a birth date are not outrageously long. Perhaps Nancy and Waldorf decided to align their birthdays: possibly for convenience, possibly as an in-joke or an intimate secret. Given their wealth, sharing a birthday party can surely not have been a money-saving measure. Or is it possible that Nancy concealed her real birth date from Waldorf? Could the shared birthday have been a ploy in her courtship? As the son of one of the richest men in the world, he was quite a catch – was it worth a small lie to grab his attention? This must all remain as speculation until more evidence emerges. Neither Fort nor any previous biographers found any mention of it in Nancy or Waldorf’s personal correspondence, though this is very extensive. 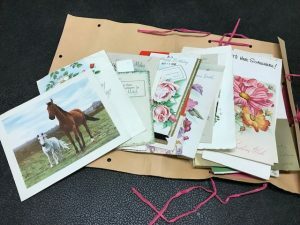 Nancy’s correspondence with her American relatives is more recently available and has been less used by researchers. Deceit, mistake or shared joke, it may well have been referred to in a deliberately obscure manner. Seekers of the truth will find the Special Collections Reading Room a pleasant and friendly environment in which to seek out needles from haystacks. As far as I know, Waldorf Astor’s birth certificate has not been checked: could there be a further twist in the tale? significance in her life or livelihood. The official record is of minimal practical benefit for the rich and famous. But as the Windrush scandal has brought into sharp focus, for many citizens the possession of verifiable identity documents can be a critical matter. It is not for nothing that patients are identified not just by their name but also by their date of birth: even then, horrific mistakes can occur. Windrush is not the first time that the quality of the data recorded by the state to identify individuals has been questioned: Dame Janet Smith’s third report as part of the Shipman Inquiry – that looking at Death Certification – noted: “The information received by registrars forms the basis of an important public record that is widely used for statistical and research purposes. It is vital that it is recorded meticulously and accurately.” It was not until 50 years after her death that the search for documentary evidence of Nancy Astor’s birth began. Most citizens rely on the integrity of such systems in their lifetimes: for the most vulnerable, this can be crucial. So let us toast Nancy Astor, whether it’s her birthday or not, for reminding us of the value of the written record. Or as the Universal Declaration on Archives puts it, “the vital necessity of archives for supporting business efficiency, accountability and transparency, for protecting citizens rights, for establishing individual and collective memory, for understanding the past, and for documenting the present to guide future actions”. Are you intrigued to do your own research on this mystery? Or just interested to know more about Nancy Astor? 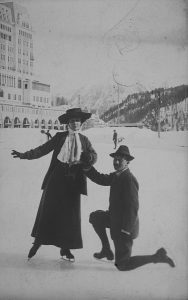 Find out more about the Papers of Nancy Astor held at Special Collections here. For further enquiries, or to request access, email specialcollections@reading.ac.uk. 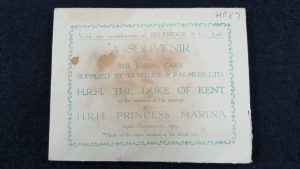 Inspired by the “Royal Wedding Fever” surrounding the upcoming nuptials of Prince Harry and Meghan Markle, Librarian Bethan Davies takes a closer look at the archive of Reading biscuit manufacturers Huntley & Palmers, and their bakes for previous Royal Weddings! Primarily known for producing biscuits, Huntley and Palmers resisted selling everyday cakes until after World War II, when it started selling simple slab cakes. 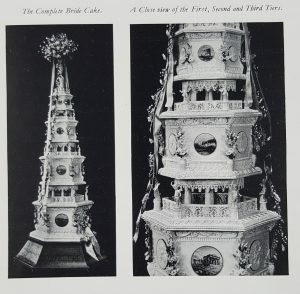 From the beginning, however, Huntley and Palmers would create wedding cakes to order, and by the 1930s, had begun to produce elaborate wedding cake catalogues to sell their products, similar to this 1970 example. 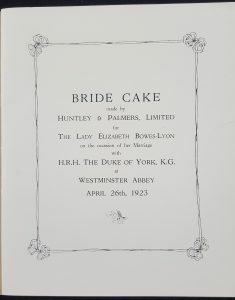 Three of their most memorable wedding cakes were created for the Royal Family, and our Huntley & Palmers Archive provides a fascinating snapshot into each of these spectacular creations! The first royal wedding cake from our archive was created in celebration of the wedding of Prince George, Duke of Kent and Princess Marina of Greece, on November 29th, 1934. Huntley & Palmers produced a wonderful four tiered hexagonal cake, measuring 8 feet high and 33 inches across the base. 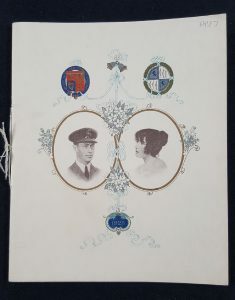 The cake design was influenced by the bride’s background, as Princess Marina was the daughter of the exiled Prince Nicholas of Greece and Denmark. The official cake description states the design is inspired by “the symmetry and balance which was the underlying principle of Greek architecture”. It goes on to state that all the scrolls, images and patterns found on the cake could be found either in the famous “Greek Temples”, or, more closer to home, in the British Museum. The glamorous Princess Marina inspired a growing public fascination with the Royal Family. 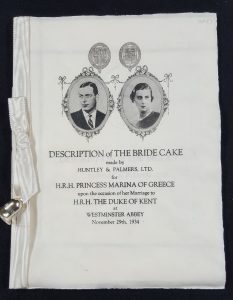 To capture this, the department store Selfridges sold souvenir samples of the Huntley & Palmers wedding cake (or at least, “made from the same batch” as the royal wedding cake), distributing 100,000 pieces throughout the store. Our archive includes one of these cake samples, kindly provided by a Mrs. M H Smith from Newark, alongside the original letter of distribution from Selfridges. 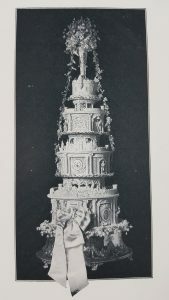 Prior to the 1934 wedding, Huntley & Palmers had created a previous Royal wedding cake, for the then-Lady Elizabeth Bowes-Lyon and Prince Albert, Duke of York in 1923. Like the Princess Marina cake, this cake is 8 feet high with four tiers, but was cylindrical, and was inspired by Lady Elizabeth’s Scottish heritage. The cake was decorated with York roses, lions, thistles, roses, doves and the crests of the Strathmore family, the Royal Air Force and the Royal Navy. Three of the tiers included sugar work reproductions of Windsor Castle, Glamis Castle (the Bowes-Lyon ancestral home), and the famous Glasmis Castle garden and sundial. The top tier was decorated with a scroll which lists Lady Elizabeth’s ancestors through marriage. 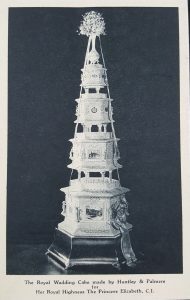 Image from within the official description showing the Wedding Cake. Inner page from within the official cake description. 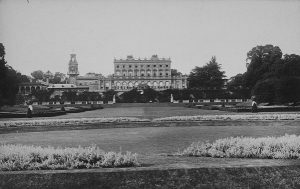 Before the cake was sent to the palace, the cake was famously displayed at Huntley & Palmer’s in Reading. The factory estimated that over 600 people came to view the wedding cake. You can see a video of this event through on the British Pathe website. Many years later, Elizabeth, then the Queen Mother, viewed a replica of her wedding cake on a tour of Huntley & Palmers. 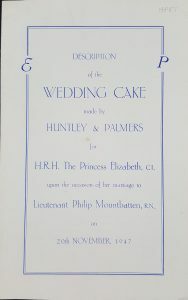 Twenty-four years after creating a wedding cake for her parents, Huntley & Palmers created a wedding cake for the wedding of the then Princess Elizabeth and Lieutenant Philip Mountbatten, 20th November, 1947. The cake, which was one of 11 cakes presented to the couple, was specifically requested by Buckingham Palace to be reduced in size. This was because wartime rationing was still in effect, and so the cake was re-designed from its intended weight of 400 lb, to an “austerity” size of 195 lb. 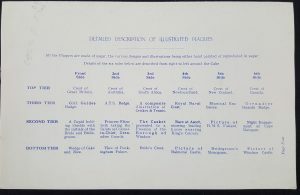 Even with this specification, the cake was a four tiered masterpiece with each tier’s 6 sides incorporating hand paintings or sugar reproductions of scenes and images which “reflected the Princess and Lieutenant’s interests” – including Balmoral Castle and the horse races at Ascot. No wonder the icing alone took around three weeks to complete! Image of the cake created for Princess Elizabeth and Ll. Philip Mountbattan’s wedding, MS HP 87. Page describing the sixteen separate decorations on the wedding cake. The front cover of the official wedding cake description. These archival finds show the royal links to Huntley & Palmers, and Reading in general. It’s clear that our archive goes beyond biscuits! These items are taken from our Huntley & Palmers Archive, which is open to view for researchers and the public. To request access, or for further enquiries, email specialcollections@reading.ac.uk.